Britain is bracing itself for the heaviest snow on record which when it happens is thought to be likely to cover Britain in a 3-4 metre blanket of snow, which it is thought will then take up to several months to thaw. 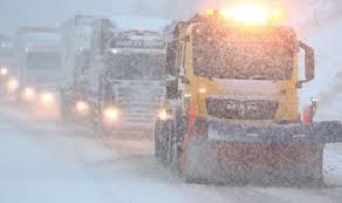 Indeed a spokesman for the Met Office has confirmed that the heaviest snow on record would involve unprecedented levels of snow, the like the country has not seen before. “It might be this week-end. It might be early on next week. Or it might not happen until next February. Or even the year after next. But sooner or later it will snow and if it is the worst snow on record you can be sure that it will be by its definition worse than any snow that has been recorded before.” he told us. The Government have urged people to stay indoors until such time that the snow starts and then to remain indoors until such time that it stops again, and not to travel unless it’s to the pub. However, it is thought not everyone will heed the advice. We spoke to one member of the public who was already planning a long car journey despite the not inconceivable chances of not only snow at some point but the heaviest snow on record. “I can’t wait. It’s the one time that you can legally sleep in your car in the middle lane of the M11” he explained. I thought I was reading the front page of the Daily Mail!! !